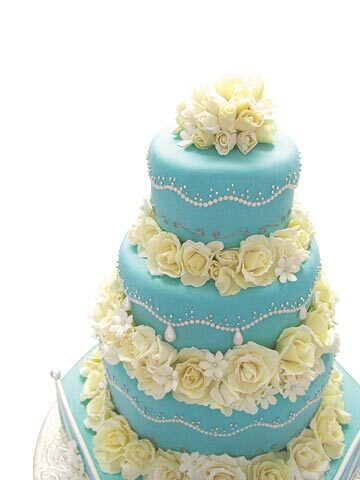 This cake is covered in chocolate (rather than fondant) and features beautiful chocolate roses and stephanotis. First Mistake: I made my first batch using white chocolate chips. IT DOES NOT WORK. Apparently chips are treated with something to make them hold their shape. The modeling chocolate was lumpy, and after I refrigerated it, it was hard as a brick. I used 2 Ghirardelli bars for this, but I am anxious to try other varieties. Cut or break up the chocolate, and put it in a microwave safe bowl. Melt it in the microwave using 30 second intervals and stirring, to avoid burning. Heat the corn syrup in a separate bowl, but be careful! You want the corn syrup to be a similar temperature to the chocolate, but it heats very quickly in the microwave. Second Mistake: I tried a finger test (dipping my finger in the corn syrup) and I DO NOT recommend this approach. The corn syrup was much hotter than I anticipated, and it's very sticky, so hard to get off your finger. Don't make my mistake and end up screaming while you can't get the corn syrup off your finger. Anyway, combine your warmed corn syrup and melted white chocolate, and stir quickly with a rubber spatula. Once mixed, pour onto plastic wrap. Double wrap and let set for a couple hours in the fridge. Once your chocolate has set, you can break off a piece and knead it with your hand to make it pliable. I was particularly interested in trying roses. To make roses, I rolled out some modeling chocolate on a Sil-pat (an amazing nonstick mat that is heat proof... awesome investment). Then, I cut out circles, and manipulated them with the double-sided ball gum-paste tool-- I have this kit . The goal was to thin the edges of the petals to make them more realistic. To form the flowers, I wrapped one petal around a small ball to for the center, then did layers of 3, 5, and 7 petals. The large roses were made with a 1 1/2 in round cutter, and the small roses were made with a 5/8 in round cutter. I think these would look amazing on a wedding cake, but they are time consuming! Would take quite some time to make the hundred or two that would be required to make even a small version of the Tiffany Cake I liked earlier. The good news is, they taste like chocolate! I did taste some modeling chocolate. I think it's tastier than gum paste (the more common medium for making sugar flowers-- see Sylvia Weinstock's work if you haven't already.) It tastes like chocolate, but it's a bit chewy, like taffy. I think these have a lot of potential! Modeling chocolate is fun to try and doesn't require a lot of supplies. I'd say, go for it! Hey Roxanne! It's Christen Juel. Love the flowers!! I actually bought a book on clay flowers (called Clay Art for All Seasons...can't link it here for some reason)that is GREAT and wonder if the techniques used to make them would be something you could do with modeling chocolate as well? 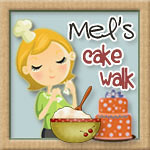 hey Roxanne.. your blog interested me as I fell in the same category.. an engineer who just discovered a passion for cake decorating..I joined the wilton classes last month.I go to the michaels in Smyrna.. what about you? the love the modeling chocolate roses.. can you tell me how much the recipe you used makes? also i guess we can pretty much do everything we did with gumpaste, with modeling chocolate.. I've been taking classes at the Cake Art Party Store in Tucker, GA. They offer the Wilton classes, but a bunch of others as well. I made that small batch recipe I described above (1/2 lb chocolate), which I used to make 4 large roses and probably 12-15 smaller roses. Hope that helps! There is some more modeling chocolate work in my newest post (Doctoral Thesis Cake). I really enjoyed the post. My question is can I make these and put them on top of buttercream and they will still hold their shape or with they go soft and lose their shape. Hi, Roxanne! I wanted to ask you if the diluted gel paste you used to add some color to the roses was diluted with water. Just curious because I thought that water would make the modeling chocolate turn crumbly. Thank you for the tip, Roxanne! I didn't even think of that. I may have to go with one of the extracts though since I am planning on making some decorations for my little girl's 5th birthday cake. My husband seems to think that a little vodka wouldn't make that much of a difference and would evaporate but for me, the idea of modeling chocolate decorations painted with vodka diluted gel paste is a bit unnerving. How do you make a LOT of moddling clay because i need to make my sisters birthday cake. I love making cakes and stuff like that. It is going to be like kind of a big cake. It is going to have little snowmen haveing a snowball cake. I think it is going to look very cut. I think. Do you think so? O and again how do you make a LARGE batch of moddling clay. It is in Deember so I don't need right away. But please as soon as you can write to me and do you like cake worse? Thanks again!!!!!!!!!!!!!!!!!!!!!!!!!!!!!!! Alternatively, you can buy it commercially in buckets. Good luck with your snowman cake! Hi Roxanne, I'm just wondering where you got your supplies from: the cutters and gum-paste ball tool? And do they have a website? As I love in London. Your roses look absolutely amazing by the way. Calijava, or Sugar Craft both sell supplies and deliver everywhere. Not terribly expensive. Sorry I don't have the links but easy to look up online!! Hi Roxanne, I'm just wondering what type of chocolate did you use? Cooking chocolate or just regular chocolate? I'm getting ready to make a birthday cake for my son using molding chocolate (it's my first time - using chocolate, I mean, not making a cake). I came across your blog and all I have to say is wow. Just . . . wow! has come out perfectly with white chips. Good luck! I recently made modeling chocolate using white chocolate chips. As you said, it turned into a hard lumpy brick. However, when a piece of the chocolate is cut off and kneaded, it soon becomes smooth and pliable like clay.